South Clettraval wheelhouse, interior view from south. 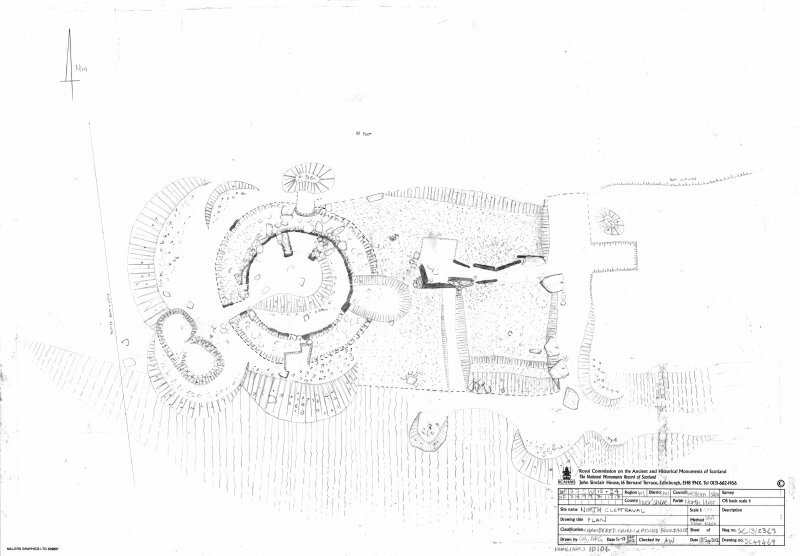 North Clettraval, Chambered cairn & aisled roundhouse, Ground plan. South Clettraval wheelhouse, interior view from south west. South Clettraval wheelhouse, view from east. 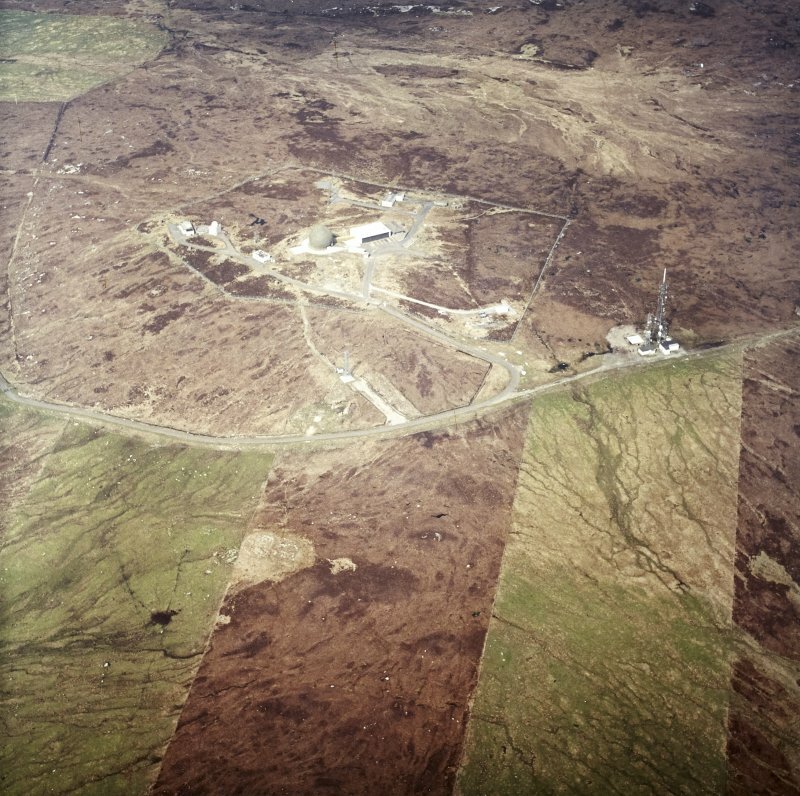 The aisled roundhouse, taken from the E.
Oblique aerial view centred on the radar station with the remains of the chambered cairn and aisled house adjacent, taken from the SSE. South Clettraval wheelhouse, detail of entrance. An aisled round house with outbuildings, all lying within an enclosure wall. The site, which overlies the west end of the chambered cairn (NF77SW 15), was excavated by Scott in the 1930s and 1940s and pottery, now in the National Museum of Antiquities of Scotland (NMAS), indicated a date at the end of the 1st century BC, although sherds dating to the 5th-6th century's AD were also recovered. W L Scott 1935 and 1948; L Scott 1950; L Laing 1975. The round house is 7.5m in diameter within a wall c. 2.2m thick and c. 1.2m high, with four piers still standing in its north arc. The outbuildings and enclosure wall are barely 0.4m high. Visited by OS 17 June 1965.
an elevation of about 400 feet above sea-level, are the ruins of a circular dun measuring 27 feet in diameter internally, with the wall showing a thickness of 8 feet on the west. The inner face of the wall is traceable for a considerable part of the circumference, one or two courses of building remaining in situ in places. Towards the west-south-west is an oval chamber, 7 feet in length and 4 feet 6 inches at its greatest width, built transversely in the thickness of the wall. It is impossible to say if this was the entrance, as the outer part of the wall is here broken, and it is built up on the inside. An aisled round house with outbuildings, all lying within an enclosure wall. The site, which overlies the west end of the chambered cairn (NF77SW 15), was excavated by Scott in the 1930s and 1940s and pottery, now in the National Museum of Antiquities of Scotland (NMAS), indicated a date at the end of the 1st century BC, although sherds dating to the 5th-6th century's AD were also recovered. W L Scott 1935 and 1948; L Scott 1950; L Laing 1975. 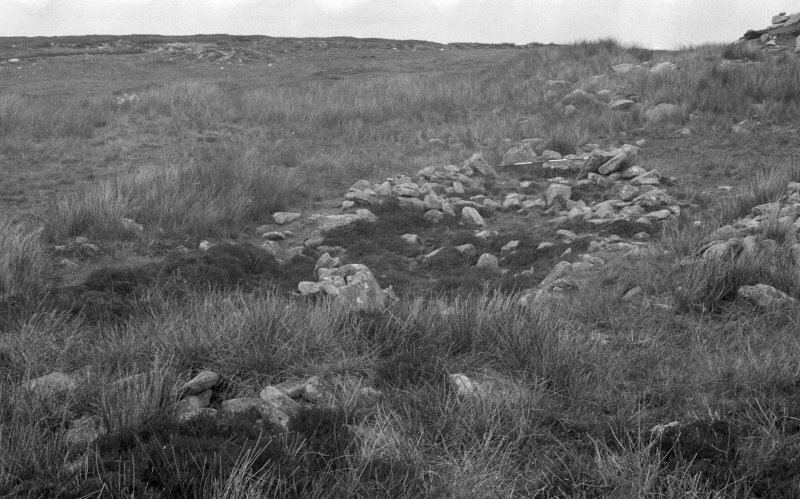 Although the cairn at Clettraval is a long wedge shape, it has suffered severely from robbing, and the original outline is no longer visible; its chamber, however, belongs to the Clyde type and it is thus unique in the Western Isles. At the east end, slabs forming the farade are visible, mainly on the south side of the chamber, where a line of five is conspicuous, now slightly displaced from their true positions. Some kerb-stones can also be seen on the south side of the cairn. Most of the large slabs of the chamber walls also remain, set in overlapping pairs, so that the faces of the chamber walls are not straight, but stepped, rather like the sections of a telescope. There are sill-slabs across the chamber at the junction of each pair of stones. At the west end are two upright slabs, which are the remains of the end compartment A large quantity of neolithic and Beaker pottery, now in NMAS, was found when the cairn was excavated in 1934, but only a few pieces of burnt bone survived of the burial deposits. Immediately to the west of this, and at a lower level, is the site of a circular house of iron-age date; the inner wall face can be clearly seen in its northern half though obscured by fallen stones on the south side; also in the northern half can be seen several radial walls, like the spokes of a wheel, but the central area was left open. Wheelhouses' such as this are not uncommon in the Uists and Barra, although few are visible above ground. 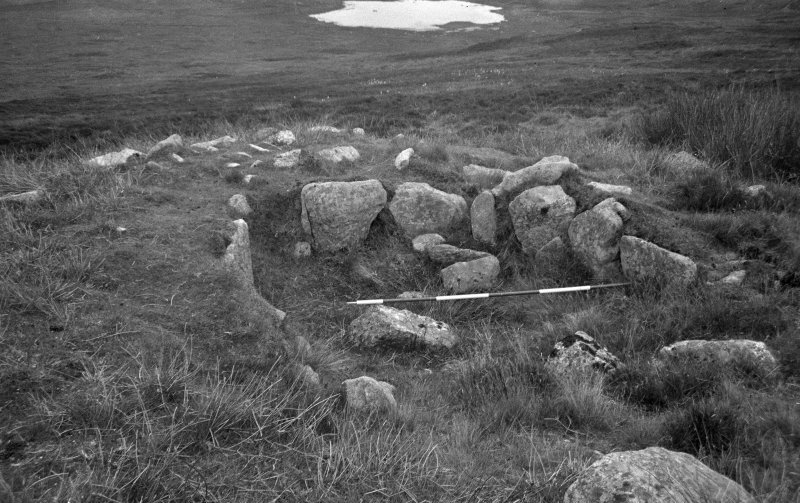 This above-ground aisled wheel-house, stands on moorland in North Uist and is set into the cairn of a Neolithic tomb . It was originally thought to be a dun  but excavation of the chambered tomb by Sir Lindsay Scott between 1946-48 revealed its true nature. Despite Scott's detailed report  the structure was still termed a 'dun' in a 1963 guide book – an uncharacteristic oversight by the author . Scott called Clettraval an “aisled roundhouse” – a broad category which he also used for wheel-houses, 'wags' and hut circles. The term 'aisled wheelhouse' is preferred here because it makes it clear that this was a stone structure. He assumed that all of these “aisled roundhouses” were derived from the round wooden Iron Age huts, with an internal circle of posts, found in southern and south-western England. He was presumably not aware that such wooden roundhouses also occur in south-east Scotland; the Royal Commission's Inventory of Roxburghshire did not appear until some years later (RCAHMS 1956). The free-standing stone piers were, in this view, the equivalents in a treeless zone of such internal posts. Clettraval was the first above-ground wheelhouse to be discovered which was set within its own farmyard wall accompanied by subsidiary buildings. Part of the wall was standing to its original height with the turf capping still in place, and some of the lintels bridging the inner ends of the piers were found where they had fallen. These rare fragments of evidence allowed Scott to make some specific inferences about the nature of the roof. He also carried out the first systematic study of the pottery from an Iron Age site in the west, and the name of the site is now used for a specific sub-style of Everted Rim ware. It is important to remember that Scott's plans and elevations of the structure, and his sections of the deposits [3, Pl. V], present much more detail about the roundhouse than was common in his day. He and John Hamilton together may be said to have brought modern scientific excavation to the Iron Age sites of Atlantic Scotland (Vol. 1, 38-9). The description of the work at Clettraval as “old fashioned dilettantism” is extremely unfair and, judging from earlier remarks, was not really serious (Crawford 2002, 114 and 117). 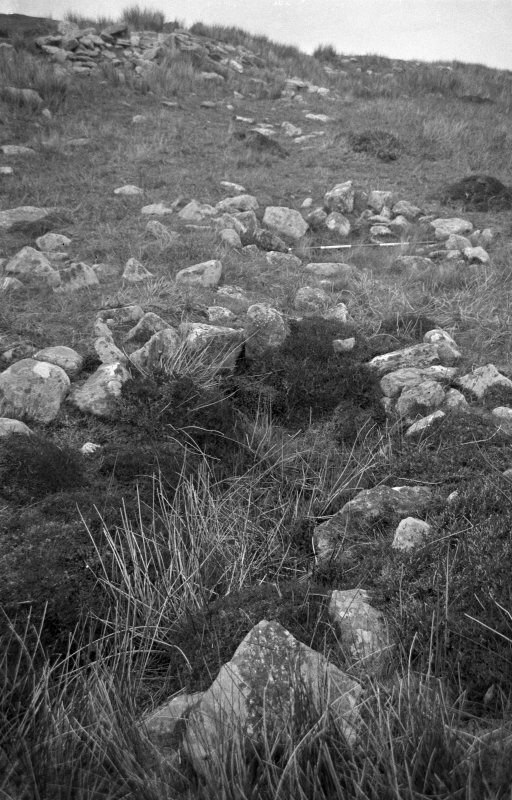 When the roundhouse was constructed the old cairn material was pushed aside so that the floor of the interior was mostly on the underlying rock. Four stages of occupation were identified. In Phase 1 the roundhouse was built, together with the surrounding structures, and the farm underwent most of its primary use. In Phase 2 the roof was reconstructed with a slightly smaller span, subsidiary pillars being put up against the ends of two of the piers. The hearth was also rebuilt and had not been subjected to much heat; this phase may therefore have been short. In Phase 3 the roof collapsed and the resulting rubble was not removed; a small hut was built in the west part of the interior and the original entrance had a new floor, 0.305m (12 in) above the original one, which led to this. 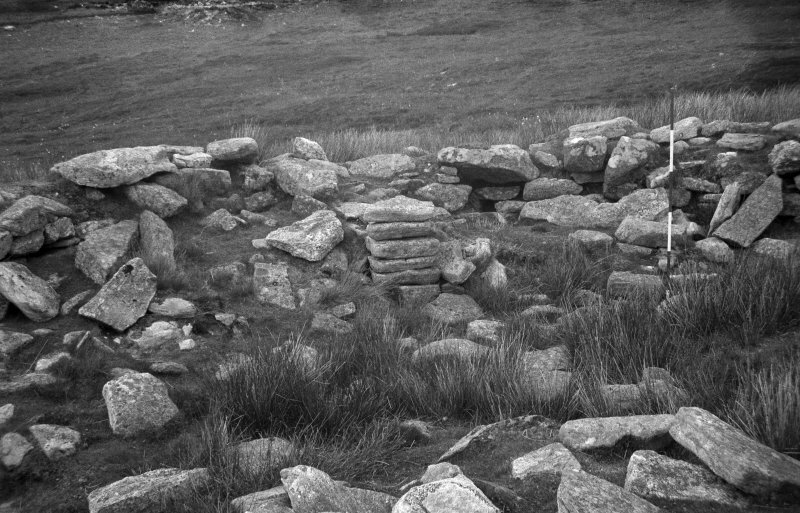 Phase 4 saw the entrance further filled with 69cm (2 ft 3 in) of debris and a small hut built over it and within the thickness of the wall. No further disturbance took place. The original roundhouse had an internal diameter of 7.78m (25.5 ft) which was reduced by eight radial piers to 4.12m (13.5 ft); the 'aisle' between the piers and the outer wall was somewhat less than 61cm ( 2 ft) wide. There was a gap where pier R8 would have been and a flat slab at its presumed inner end suggests that there was a stout post here instead. The main wall – about 2.44m (8 ft) thick – was faced on both sides with coursed masonry and contained a rubble core; the faces seem to have been vertical and the outer one was mainly a rough revetment except on either side of the entrance where it was better built. Between Bays VI and IX the full wall height was preserved, to just over 1.2m (4 ft), and the wallhead had been covered with horizontally laid turves, slanting downwards and outwards and faced with stone on the inside. At the back of Bay VI the inner face of the wall was preserved high enough for a “shelf” 30cm (12 in) wide to be present just under 1.2m (4 ft) above the floor [3, Pl. V, section A-B]. One would normally call such a feature a scarcement but here the ledge is so close to the top of the wall that some other purpose for it must be inferred than the support for a raised wooden floor (the radial piers, if primary, would preclude that hypothesis in any case). This discovery of a genuine roof-supportimg scarcement in a wheelhouse was doubtless the main reason for Scott (1947) feeling able to extend the roof-support hypothesis to brochs, and to assume therefore that the walls of the latter never extended much above the scarcement. The entrance passage was straight, with the sill, rebate and bar-hole for the door at the inner end, and a drain ran out under the floor. The underlying rock was uneven and there were marked differences between the floor levels of the Bays. The drain probably took away water which ran along the rock surface. Most of the central area was paved as were many of the bays. The inner ends of the piers were joined by a kerb of thick slabs which may have served as seats round the central fireplace. This was round, 1.2m (4 ft) in diameter and badly incinerated. On top of it was the later hearth – horseshoe-shaped, paved and massively kerbed; it did not exhibit much evidence of burning. There was a pile of peat ash at one end which looked as if it had been left there when the house was abandoned. The Bays are numbered anti-clock-wise, starting with the one reached by the entrance; they contained much peat ash but few artifacts. A pile of yellow clay was in Bay VI with three large hammer-stones which may have been used to work it. Bays III and VII were half paved and fine, carbonised willow stalks were found on the floor, suggesting bedding. Bays VIII and IX were larger, with beaten earth floors, and may have been used for storage. Bay IV led to the door of a mural chamber at 1.30 o'clock and which had been walled up at the end of Phase 2. The chamber had collapsed but seems to have been paved; a triangular lintel 91cm (3 ft) long had fallen into it also and presumably once spanned its doorway. The farmyard The roundhouse was partly enclosed on the western side by a wall of turf and stone about 1.8m (6 ft) thick at the base; its greatest distance from the house was about 55m (60 yds) on the west but it comes somewhat closer on the north and south before it disappears. Within the enclosed area were several subsidiary buildings including a rectangular stone byre and several working places. From the plan [3, fig. 4] the byre measured about 6.1m wide at the west end (narrower on the east) by 9.76m in length (20 by 32 ft) overall; it was aligned along a fairly steep slope [3, fig. 4, section]. The side walls were loosely built and the lower end wall even more so (although one must presumably make allowances for damage and disintegration over nineteen centuries or more). One internal stone pier projected from the lower end and another short pier came out of one side. The floor was cobbled and a spread of peat ash was found on it. The even distribution of debris over the interior led Scott to infer that there had been flimsy stone partition walls. The absence of a built doorway was a puzzle and it was deduced that the lower end wall may have been dismantled to allow the cleaning out of the interior. There were six other small buildings, or partly enclosed small spaces, inside the farmyard; one of the latter (B) had a part-paved floor and may have been, together with D and F, byres for smaller animals. The other three were attached to the roundhouse wall and were deemed to be sheltered working places. Building C contained much pottery and there was a large hearth on an adjacent rubble platform. The walls of these shelters seemed to be about 60cm high at the back, sloping towards the front, and they may have supported thatched roofs with an open wooden framework at the front. Social status. There are two aspects of this site which suggest that it was occupied by a high-status group though, if it was, the absence of most of the jewelry and pins which also seem to imply this at other sites is surprising. 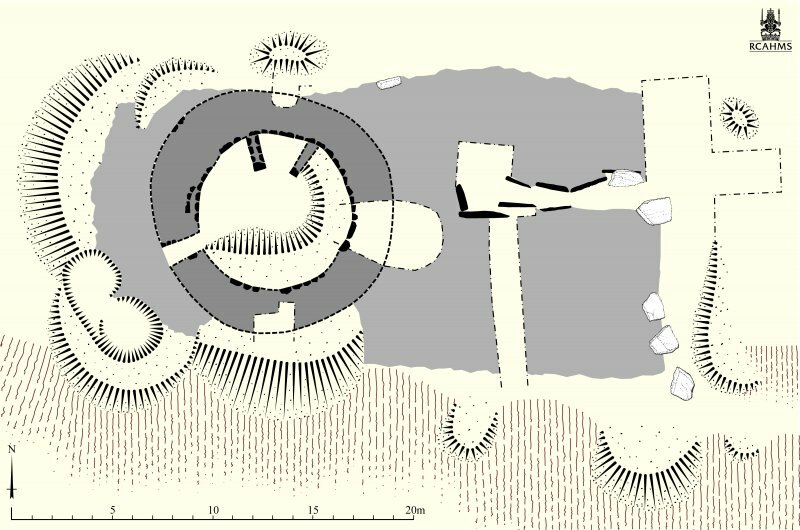 The first aspect is the design of the site; this is a full-scale Iron Age farm with large central roundhouse with a fairly complex roof structure, outbuildings and a boundary wall. The second is the fact that the interior of the roundhouse seems to have been swept out regularly; it contrasts in this way with many others in which black occupation layers are common. The assumption made here is that there were retainers to do the sweeping and cleaning. This surely means that the house was inhabited by people with higher standards of cleanliness than normal – that is, members of the tribal élite. Roofing. Scott's reconstruction of the roof assumed that the piers were never much higher than when they were found, that is little more than 91cm (3 ft) above the Phase 1 floor. This belief is supported by the fact that the outer wall seems to have stood complete on the western side and here the masonry of the inner face only stood some 1.30m (4.25 ft) above the floor [3, Pl. V, section AB] (Illus. 9.108). It seems reasonable how-ever to suppose that the height of the piers matched that of the outer wall and rose to at least 1.22m (4 ft) or even more; the need for reasonably headroom at least in the inner parts of the bays may mean that they were higher at their inner ends. The piers were braced against the outer wall by pairs of lintels bridging the 'aisle' and a few of which survived in position (Illus. 9.109). The fact that one of the piers seems to have been a wooden post resting on a stone base precludes any stone corbelled roofing over the bays and lack of rubble means that there was certainly no stone dome over the central area. Scott thought that the bays were probably roofed with horizontal timbers. A number of fallen stone slabs were found in the central area and there were deduced by Scott to have formed an architrave along the inner ends of the piers bounding Bays VIII and IX [3, fig. 2] (Illus. 9.109: see site NF74 4 above). An orthostat in front of Bay VIII presumably also helped to hold up the architrave here, which elsewhere was presumably of wood. 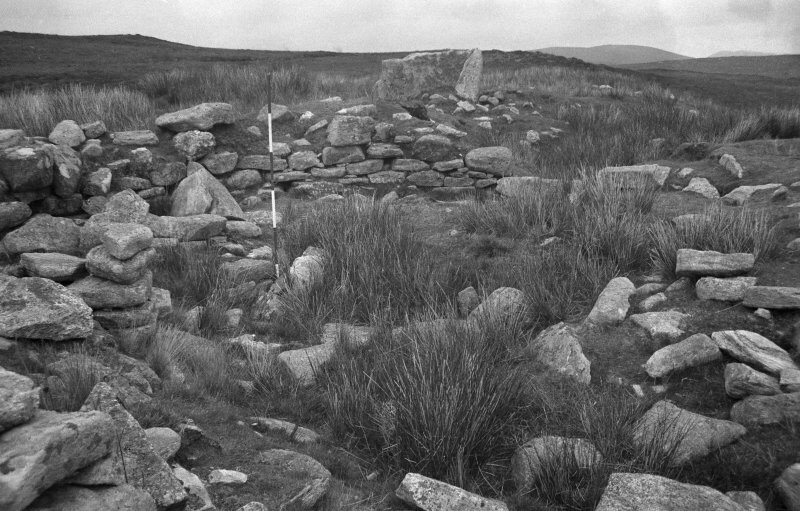 From this raised ring of beams and stone slabs the central area was presumed to have been roofed with rafter poles meeting at the tip of a shallow cone. The whole was then doubtless weighted down with cross- rafters and turves [3, fig. 2, V]. The outer and lowest part of the roof was presumed to have ended against the inner wallface which was built slightly higher to prevent the wind getting under the rafters (and as an inner revetment for the wallhead covering of turf, as noted earlier). 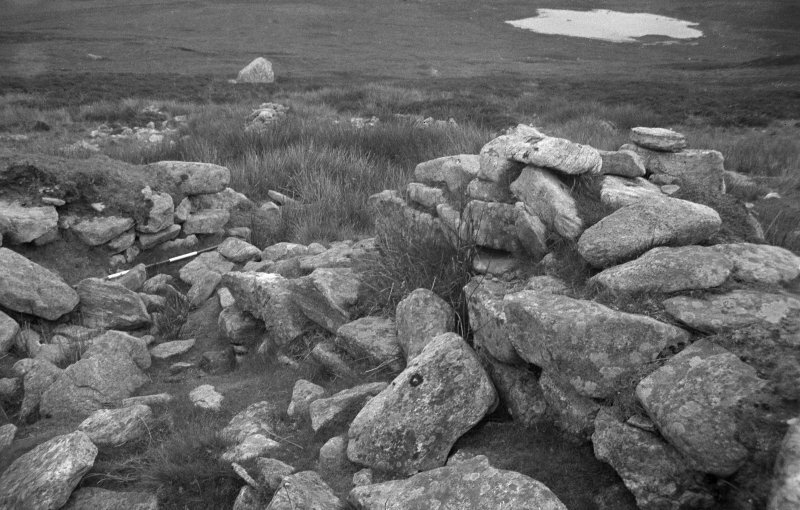 (3) that it rested (weighted down with ropes and stones) on the wallhead rather than against the inner face, this being the way the builders of recent thick-walled Hebridean houses used to ensure that the rain did not drain into the living space. He would add point (4) – that the top of the roof was a single cone with no part of it flat, though Scott's final reconstruction seems to be implying that. A conical thatched roof spanning the whole of the interior – and draining onto the turf-covered wallhead – surely must have been essential in the wet climate of the Outer Isles. Economy. 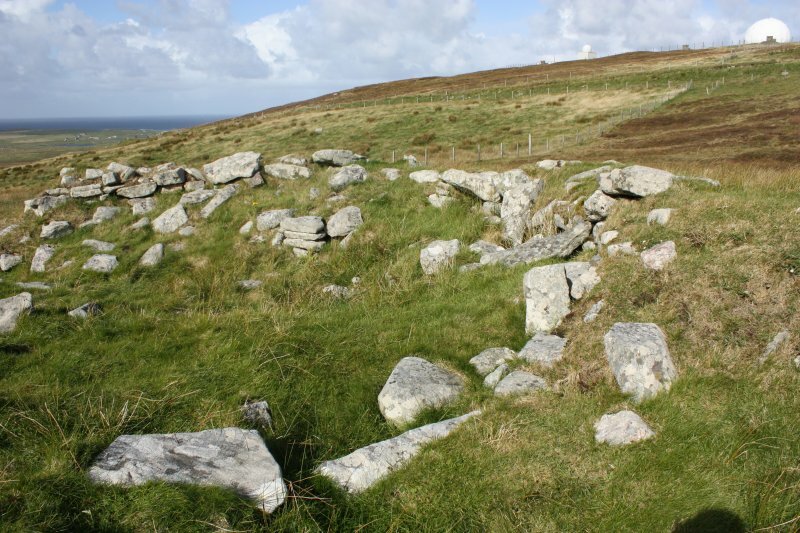 The absence of bone artifacts or animal bones precludes any inferences about the economy of the farm, but the absence of rotary querns – extremely unusual in an Atlantic Iron Age site – nevertheless suggests that this was a cattle farm with no cultivable field attached. Its position on raised moorland may support this idea. Non-ceramic material culture. Surprisingly few artifacts were found at this roundhouse site and they do not tell us much. The glass bead is likely to have arrived by trade and the triangular crucible is one of those artifacts which are also found in south-west England. Pottery. This consisted mostly of small sherds, few of which were contiguous, so (as at Dun Vulan – NF72 1) it was difficult both to build up large vessel profiles and to isolate ceramic styles. The absence of sherds from the central area of the roundhouse suggested that this had been swept frequently. This lack of whole pots or even large sherds inclined Scott to treat the whole assemblage statistic-ally. He listed the various types of rim, and the individual decorative features, and counted the frequency of these in each layer. These individual traits were then compared with similar features in what was then known as the 'Iron Age B' pottery of south-west England and north-west France. 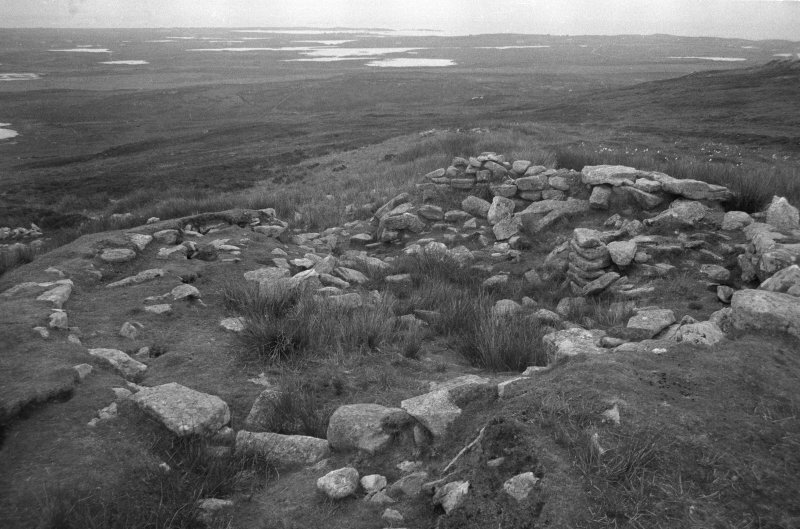 The substantial number of similarities found led Scott to the conclusion that his “Aisled Roundhouse Culture” had only recently arrived in the Hebrides from south-west England. Leaving aside the assumptions made with the diffusionist mindset which prevailed at the time, the method is of dubious validity in that it cannot define the shape and decoration of individual pots; only if a complete and distinctive ceramic style was found to have existed both in the south and in the Hebrides would some form of immigration be reasonably clearly indicated. Scott's method is known as 'trait chasing' and ought long to have been abandoned. However elements of it appear in the reports on Dun Vulan (NF72 1) and Sollas (NF87 5). In fact the Clettraval potsherds seem to be from the same two Iron Age ceramic styles which are now known to recur throughout the Hebrides and Scott's photographs [3, pls. VIII and IX] illustrate them well. The first consists of vessels having a zig-zag cordon applied about a third of the way down the rounded pot, and applied cordons and concentric channelled arches above this; the style is now known as the Clettraval sub-style of Everted Rim ware, after this site. The second plate shows the second style – sherds with incised decoration which look like Vaul ware. The drawings appear to confirm this conclusion [3, fig. 99]. The Clettraval sub-style and Vaul ware are both confined almost entirely to the Western Isles and are not found in south-west England or north-west France; hence a simple immigration from those areas cannot be inferred from this evidence. Whether other aspects of the material culture – and in particular the Everted Rim pottery itself – imply a period of close contact with the south at an earlier time is a moot point. Some later pottery of the 5th/6th centuries AD was identified by Laing . At that time this appeared to present a chronological problem but evidence has since accumulated that the middle Iron Age culture of Atlantic Scotland lasted at least until AD 500 and probably well into the 6th century. The fact that the Clettraval style seems to have been on the site from its earliest period also suggests that this wheelhouse was one of the later ones, and that it was probably not built until the 3rd century at the earliest. Iron. No trace of the metal was found but its use was inferred because of the absence of heavy stone cutting tools. Bronze: no artifacts were found but evidence of metalworking was recovered in the form of 1 small fragment of a triangular crucible with traces of bronze in it [3, pl. XII.13]. Bone tools: none were found, presumably because of the acidic soil. Stone artifacts included 1 flat, rectangular rubber, 1 disc or pot lid and several long, narrow pebbles. Pumice: several unworked lumps, 2 abraders (1 flat and 1 hollow) and a spindle whorl with an hour-glass perforation [3, pl. XII.15]. Mica: 1 disc of green chlorite, possibly a thin pendant, from Phase 2. Glass: half of a pale green, globular bead [3, pl. XII.14]. Fired clay: 1 broken spoon, including part of the bowl and the end of the handle [3, pl. XII.10 and 11]. The pottery [3, fig. 99 and pls. VIII and IX] (Illus. 9.110) is described in the 'Discussion' above. Sources: 1. NMRS site no. NF 74 SW 24: 2. RCAHMS 1928, 55-6, no. 178: 3. Scott 1948a: 4. Scott 1948b, 47-9: 5. Feachem 1963, 50: 6. Armit 1992, 59: 7. Crawford 2002, 114, 116, 117, 118, 123, 125 and 126: 8. Hingley 1999, 236, 245: 9. Laing 1975, 13: 10. Campbell 2002, 139: 11. Beveridge 1911, 254: 12. Armit 1996, 137, 143-5 and 150. This wheelhouse is situated on the S flank of South Clettraval and overlies the W end of a Neolithic chambered cairn (NF77SW 15). It measures 7.5m in diameter within a wall up to 2.5m in thickness, standing to an internal height of up to 0.7m. The entrance is on the SW and narrows from 1m externally to 0.8m. Only two of the radial piers were visible at the time of survey. The interior of the building is now choked with rubble, presumably the backfill from Scott’s excavations, the trenches of which can be most clearly seen cutting through the wall at the N, S and E; areas of rubble outside the wheelhouse to the W and SW may also be excavation spoil. Scott’s excavations also revealed a number of other structures, two adjacent to the wheelhouse at the SW, and within an enclosure further to the W (Scott 1948). These are later than the wheelhouse, and they may well be post-medieval in date. Neither the cairn nor the wheelhouse are depicted on the 1st and 2nd editions of the OS 6-inch map of North Uist (Sheet XXXIV, 1881 and 1903), and the ‘fort’ at Clettraval was first noted in Beveridge’s North Uist (1911, 189-190). Following a field visit by RCAHMS in 1914 the site was classified as a dun. The accompanying account specifically describes the secondary structures over the entrance (1928 No.178). 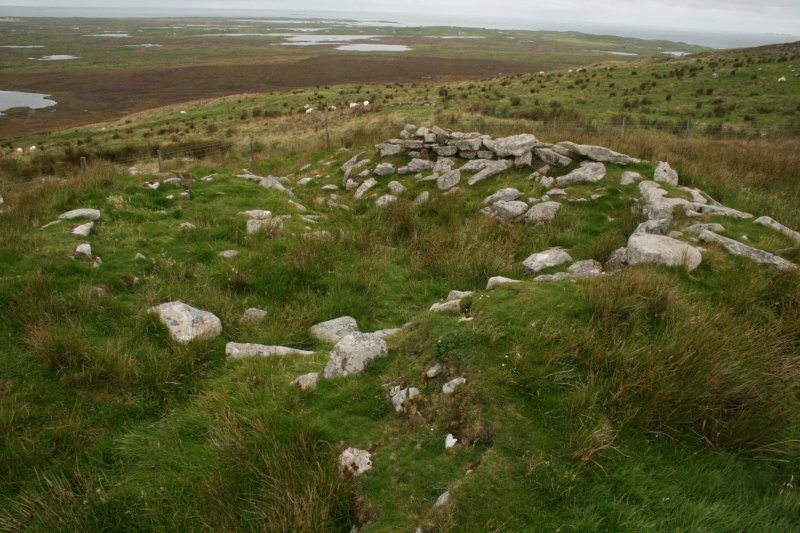 A more detailed description appeared in 1935, this time classifying the site as a fort, when WL Scott published his excavation of the chambered cairn, during which he opened a trench over the entrance of the wheelhouse. Scott’s son then led the complete excavation of the wheelhouse over three years, from 1946 to 1948 (DES 1948; Scott 1948, 47), the first wheelhouse to be excavated to modern standards (Crawford 2002, 114). The ‘relics’ from the excavations at Clettraval were deposited with the National Museum of Scotland in 1953 (PSAS 87 (1952-3), 202).